Five Great Tips For Setting Up Your Home Office | Be "Noticed"
Five Great Tips For Setting Up Your Home Office. Productivity is the key to a successful home office, and that means planning your workspace very carefully. You’re probably already aware that you’ll need to eliminate distractions and create a comfortable, flexible environment for maximum output, but what about the actual design of the room? 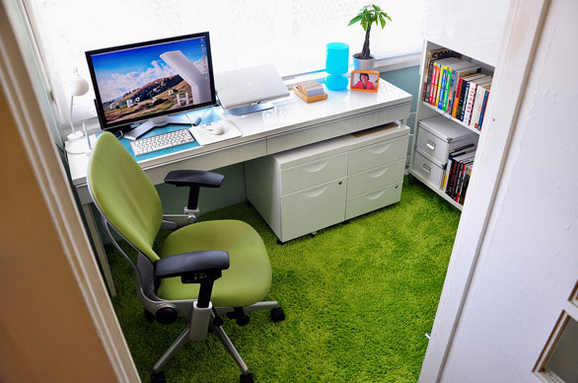 What can you do to prepare a prolific home office? Here are five ideas. You’re going to waste a lot of time if you set up your entire office only to realize that the sun rises directly into your face at 6am. You should also pay attention to the door: If your back is to it, your computer monitor facing outwards, you may be revealing private or privileged information to anyone on their way to the kitchen. Similarly, if you expect clients to visit you at home, you’ll want to be facing them when they enter the room. It may sound like obvious advice, but you’d be surprised at how many people leave their desk as an afterthought, squeezing it in between file cabinets before they realize how uncomfortable it is. Your desk is your mecca, so position it first and worry about the rest afterwards. Keep all your files and supplies organized by giving everything its proper place. For example, pens might always go in the mug, paper clips and post-its in the first drawer. New paperwork could be the only kind allowed on the desk, with older documents put into trays or file cabinets. When you’re in the productivity zone, the last thing you’ll want to do is drop everything and go hunting for the stapler. In that vein, you’re much more likely to procrastinate on projects if you have to wander the room to gather all your supplies. Either keep everything within arm’s length or invest in a sturdy rolling chair that gives you no excuses not to work. If you have bare walls, you should never complain that your office is too cluttered. You can hang anything these days, including shelves, cubbies, wall mount cabinets, et cetera. Even the ceiling can be used for hanging baskets of supplies. Don’t get stuck in the idea of conventional design. These are just a few tips for creating an organized, efficient workspace. Working from home can be quite rewarding, but only if you’ve adequately prepared for it, so roll up your sleeves and start planning!